We’ve both been taking a HUGE number of photos though… and there’s a story behind that. Duane borrowed our good friend Terry’s little Canon point & shoot for the trip and started taking photos and liked it a lot. 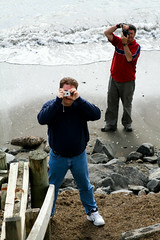 Then Jim, our wonderful host, offered to lend him his old Panasonic and he got the shutterbug. He got it BAD. So bad that he has a brand new Canon Rebel XT on order and it should be waiting at the office for us on Monday. Let’s see, what’s happened… We’ve been introduced to “real” fish and chips (not the heavily battered, greasy stuff we get at home, no, this lightly battered and crispy around the edges… perfection!) and taken day trips to the Rumataka Mountains, Paekakariki, Foxton, and Bulls. 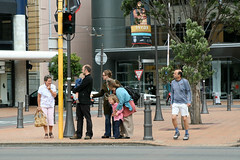 We’ve also been all over the city, we’ve met Wellington Flickr Group members and some of Jim’s extended family. I’m now thoroughly convinced that there are no unfriendly kiwis. Thoroughly convinced. Everyone has been wonderfully welcoming and generous, even when we’ve had little cross-cultural misunderstandings (Never call it ‘pop’, you’ll get a blank stare. Instead, call it Coke.) everyone has been patient, if amused. Tomorrow everyone here goes back to work and school, and Duane and I strike out on our own to tour the city. More pictures will undoubtedly ensue. The roads in New Zealand wind through valleys and up mountain sides. The bag is here! The bag is here! Sorry, but I’m just a little bit ecstatic that our checked bag made it here (finally!) from San Francisco. That means (a) that I have my tripod and (b) that we have all of our toiletries. 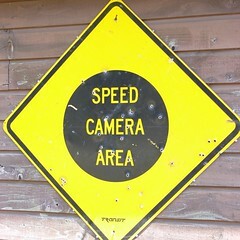 We spent yesterday driving up the West Coast to take photos, have lunch, and take more photos. Then we headed up to Paekakariki for lunch at a café. Afterward we wandered over to Steam Incorporated and took about a billion photos of rusty, decaying pieces parts from steam engines and railroad cars. Bliss! We followed that up with a walk on Paekakariki Beach, and then a crazy, crazy ride down Paekakariki Hill Road – I twisting, climbing, plunging road that was at once fun and terrifying. The closest I’ve ever come to the feeling of being in a roller coaster while sitting in a car! Just for the record, when you look at a 30 hour non-stop travel itinerary and think “Oh that’s no big deal! We’ll just sleep on the plane…” Yeah. Not gonna happen, ok? Not unless you fork out for one of those über-expensive Premier First-Class pod seats. Even then, I have my doubts! So yes, after about 30 hours of travel (and MAYBE 2 hours of sleep each… maybe) we’ve finally made it to Wellington, New Zealand. Jim was there to meet us and demonstrated all the patience of a saint when he had to wait almost an hour between our landing and our appearance. You see, our one checked bag didn’t make it. Yeah. Among the missing are my lovely new tripod, my camera bag (though none of my gear, thank God! ), our electrical outlet adapters… oh, and all of our toiletries. ALL of our toiletries. But we’re here, we’ve slept bunches, we’ve had our first bowl of Hokey Pokey ice cream which I can already tell I’m going to miss when I’m gone, and even seen a bit of the town already. I can’t wait to see what kind of trouble we get into today!!! "Did You Take Off The Lens Cap This Time?" Well, we’re in Chicago after the first and shortest leg of our 29 hour trip. I can highly recommend the grilled subs at ZOOT! Sandwich Shop in the C Concourse. Very yummy. Hold the olives, please. And Duane recommends ZOOT!s grilled combo sub (ham & turkey) and Edy’s “Triple Caramel Decadence” ice cream. You can keep an eye on all of our trip photos as we upload them here. I’ve also added the link for that set to the list of links on the left. Next stop: SYDNEY, AUSTRALIA! Woohoo! So we’re packed, and ready, and I’m just waiting for the latest episode of GREY’S ANATOMY to download from my TiVo. Then it’s off to lunch and the airport. I’m not as excited now. I’m all business. Between the two of us we’ve done a pretty good job of paring down our initial packing list and fitting the leftovers into two carry-ons and one checked bag (which will be used mostly to cart souvenirs and such on the way back). 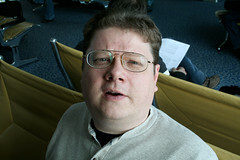 Our flight is going to take about 31 hours total with the layovers and such, assuming that there are no delays. It’s been years since I flew to London, but even that was a long flight at about 8 hours. I’m not terribly comfortable with flying in my old age either, so this should be an interesting trip. I hope I can get to sleep on the plane. 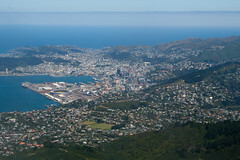 Wellington, our destination, is located on Cook Strait, a channel that runs between the North Island and the South Island – the two main islands that make up New Zealand. Because of the way the islands are shaped and placed, and in part because of the beautiful mountain ranges that run down both of them, a natural wind tunnel is created in the strait. Wellington International Airport is on the edge of the wind tunnel. Here’s a short video of a few planes battling the cross-winds as they land. Fun, fun, fun!